You get that desperately needed storage space -- an absolute must have in small space living. Storage benches are versatile in what can be stored in them from books and files to pillows and throw blankets to kitchen items to childrens' toys and more. They can be used in any room: a kitchen seating bench, a foot board at the end of a bed, and a window seat. Stand alone storage bench seats are mobile, ready to be moved to your next living space or just another room where you live. There are a wealth of designs both ready made, custom made and even do-it-yourself designs to fit your needs and decor scheme. Color, color and more color (or less color) and patterns to calm your wild spirit or kick start it. You have almost infinite choices for materials from wood to textiles. They're simple great investments. A well constructed, well designed storage bench seat will last and look beautiful for many years to come. This lovely Ikea hack with a bench was used to create this reading nook for a little girl. No, I didn't mistake the bench below as a storage bench. Clearly, it's not. But just image adding a storage bench to a dining table. This dining area corner bench is part of a make over for a home. 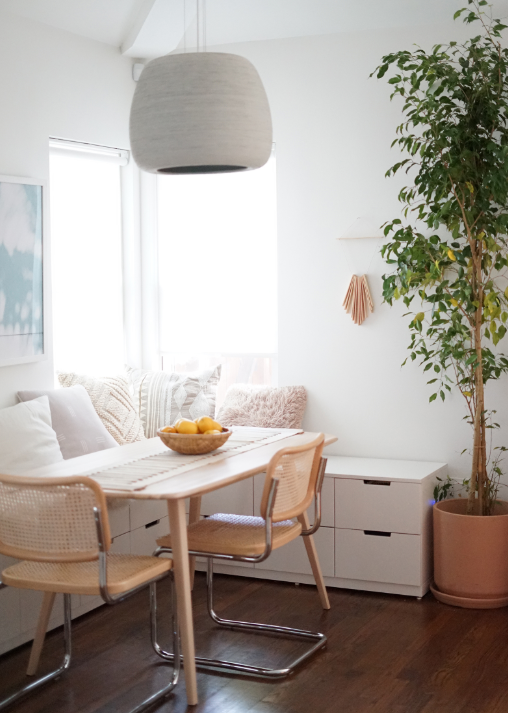 But notice just how small the area is and the use of a module system to create the corner bench--ideas for making this perfect for apartment and small space living. Even small sections from a large project can be used, such as this breakfast nook (great for small space living) with a storage bench. This is a Home Depot project. So don't overlook shopping even at home improvement stores. 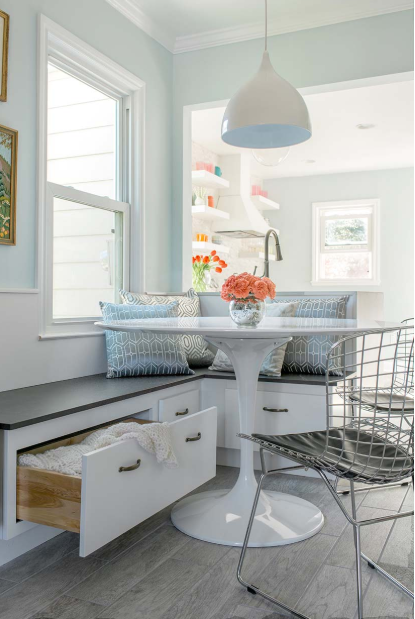 Styled as a kitchen banquet bench, this seating-storage design makes very efficient use of every inch in small space. It's a built in bench, however, a search for a module unit makes a great substitution. Storage benches can add a fabulouos colors to suit your personal taste. If you can't find that color and pattern that's just right for reflecting who you are, you can alway have a bench reupholstered or a cushion to the bench re-covered. Imagine sitting on a similar closed-in balcony having a meal and admiring a city view or better yet, nature. The storage bench on this balcony is built in but of course a moveable module storage bench would serve just as well. If you didn't know how much I love decorating and living on the porch, see my post Tip And Inspirations For Your Apartment Balcony And Porch Decor.